Lewis Terry has contributed a number of times on 8-Bit Girl, through me interviewing him on a variety of iPod games, to creating the pixel graphics seen throughout this blog. To increase the load on 8-Bit Girl (and to help me out on occasions), Lewis has offered to send me a few posts occasionally. This post is a retro review, which we originally posted up on Retro Kingdom. As that blog is closing, as sadly we do not have enough time to update it, all of our reviews will be published up here for you all to read. I hope you enjoy his work! The Super Nintendo Entertainment System (SNES) was where my childhood gaming addiction started. Before then, I had access to other games platforms, but none grabbed me as much as the SNES. 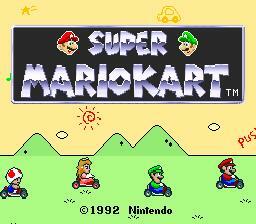 I had many favourites back in the day but one that stands out strong is the original Super Mario Kart. It seems common place now to have game characters star in other spin off games, such as sports or beat-em ups, however back then you would never have dreamed of it. So imagine you are a six year old boy who loves the Mario games and you suddenly are presented with a game where they are all placed in super fast go-karts, it is a kids dream come true. This is not saying that the game is only appealing to kids. While it is presented in bright colours and all of its its protagonists are all cute characters, the game is highly addictive and presents some of the deepest game play and strategy that was offered on the SNES. 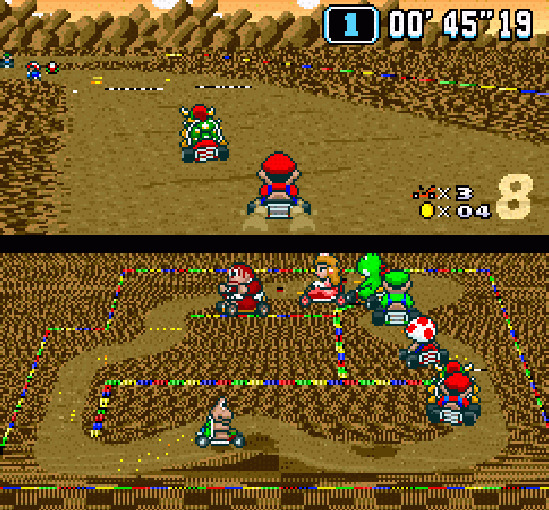 Mario Kart sold over eight million copies worldwide and held the title of Nintendo's highest selling game on the SNES. Some feat, huh? The game allows you to play one of eight characters from the Mario Brothers universe, each one possessing slightly different abilities. 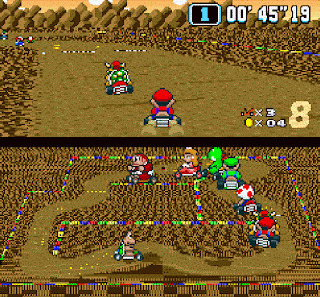 You can either race against the computer or go head to head with up to three friends via a split screen mode, racing or duking it out in a battle arena, where players fire various objects at each other. Like most games of it's time, Super Mario Kart is a hard game to master. In order to pass the 150cc cup against the computer, one must learn all the short cuts, techniques and player attributes. You have to learn how to powerslide and when to jump, and the best time to use those devastatingly satisfying red shells. After many hours of investment, you will find yourself skimming water and pulling off feats you thought were impossible, only to still be beaten by the computer. 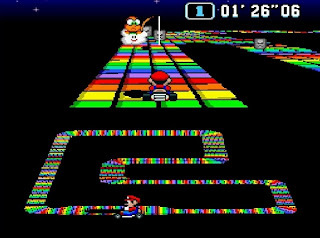 The graphics in Super Mario Kart are by todays standards dated, however they are probably the best example of Mode-7 on the SNES. Despite all of the sprites on the screen and the frenetic action the graphics all stay nice and smooth, without flicking or clipping out. The racers are animated wonderfully and have a nice amount of expression, when dazed or victorious they pull rather amusing faces. But the main draw of the game graphically is the rich race tracks, their hazards and backgrounds. From the cactus like enemies, to the Thwomps and the amazing but harsh Rainbow Road, the graphics are simply superb and are some of the best the SNES had to offer. Like all classic Nintendo games, Mario Kart's sound was amazing and well thought out. The audio in conjunction with the various sound effects all make the games atmosphere complete. The background music is in part revamped versions of existing Nintendo music and part new creations, yet they are all distinctive and crisp in their own right. No matter how relaxing the track may be when the final lap begins the music speeds up, suddenly making the game far more intense. Whether it is the background music, the coin sound effects or hearing the triumphant cries of the characters you can hear the quality of the audio. So clear is the audio that it is always possible to distinguish one characters yell from another even if they are not on screen. To most kids nowadays all of this will seem like old hat, yet it was Super Mario Kart was what layed down all of the foundations that modern novelty racers build upon. Others may see the features offered as mundane or boring, yet still to this day if you pick up a controller and give it a spin, it retains the same addiction and charm as it offered back then. There is a reason that this game sold eight million copies world wide and that is due to the games innovation and charm. While there is no need to go out and get a copy immediately, as the newer versions of Mario Kart do the same thing, Super Mario Kart is an important piece of not only Nintendo's history, but of gaming history in general. Mario Karte is phenomenon games for discussion. All game junkers does know about mario karte which is famous around the globe. I having new series of Mario Karte and i love to play this game as challenge with someone. I recently had a chance to try Super Mario Kart for the first time. While this isn't the first game I've played with Mode-7 (F-Zero on the GBA was my intro), I find it takes a while to get used to the effect. But Mario Kart is Mario Kart, still a load of fun once you get the hang of it! NDS Lite: Yeah, Mario Kart sure is awesome! Mario carte is awesome and wonderful game. This game is available in multi player mode. I have played this game with my friends as co-up mode. I have made challenge with my friends and i won it as well.